Frederick K. Brewington is admitted to the Bars of the states of New York and New Jersey, as well as the United States Supreme Court, United States First and Second Circuit Courts of Appeal, United States District Courts of New Jersey, Eastern, Southern and Northern Districts of New York. He earned a Bachelor of Arts Degree in Sociology from the State University of New York (SUNY) at Albany in 1979 (with honors) and a Juris Doctor Degree from Northeastern University School of Law in 1982. He is a prominent member of the New York State and State of New Jersey Bar Associations, National Employment Lawyers Association, Association of Trial Lawyers of America, Nassau County Bar Association as well as other various local and regional Bar associations. Raised in Lakeview, Long Island, Mr. Brewington has become a respected lawyer and community advocate with a distinguished legal career. After working at a number of prestigious firms and as a clerk at the Office of the Legal Counsel of the United States Senate, Mr. Brewington began a private practice on Long Island. With his expertise in civil rights litigation, he has successfully challenged the 'at large' voting system in the Town of Hempstead and worked on preventing future unconstitutional and discriminatory purging of voters from the voting role. Mr. Brewington challenges other discriminatory practices throughout Long Island as well. With his sustained focus on issues such as affordable housing, community revitalization efforts, employment and civil rights, the environment and, especially, voting rights and fair representation in government, Mr. Brewington has labored against injustices through litigating, writing, lecturing, and through building relationships of encouragement among citizen organizations. As a result of his hard work and dedication, Long Island Press has named him one of the top 50 most powerful people in Long Island a total of three times. Mr. Brewington is also an adjunct Professor at Jacob D. Fuchsberg Law Center, Touro College, served as President of the Alumni Association of SUNY, Albany and remains a member of their Council of Classes. 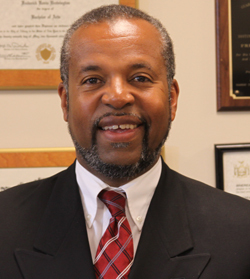 Providing services pro bono, Mr. Brewington has been an advisor to many community groups and organizations. He has also served as a Trustee and as Chairman of the Administrative Board of the Church of the Good Shepherd United Methodist; is a Certified Lay Servant for the Long Island East District of the New York Annual Conference of the United Methodist Church and currently is an instructor for Local Lay Servants.